The year is 1967, and the countertop material of the future has arrived! It’s durable, it’s heat resistant, it’s shiny, and best of all it almost mimics real stone. This material is solid surface. Tired of plastic laminate burning and scratching at every touch, Americans fell in love with the composite countertop product as soon as it hit the market. Solid surface appeared more natural than other manufactured counter-top options and it had the benefit of being cheaper than natural stone. It was top of the line – in 1967. Solid surface manufacturers admit that it will scratch, however, they atone for this defect by claiming the scratches are easily repaired or buffed out. But why spend thousands of dollars on a product that scratches in the first place? Like granite, EQ is extremely hard and scratch resistant and has even been known to dull knives if cut upon. Cutting boards are advised for EQ to save your knives, not your countertops. One area where EQ and solid surface perform equally is chemical resistance, taking almost no damage from bleach or acid (i.e. vinegar, lemon juice, coffee) as long as the spill is wiped away within a reasonable amount of time. Unlike granite and marble, EQ and solid surface are non-porous, so chemicals will not saturate the surface and are easily wiped away without issue. Solid surface consists of about 30-35% resin and 65-70% natural minerals, most of which is a fine white powder called alumina trihydrate. This powder is held together by the resin and formed into the various veins, swirls, and colors found in solid surface. EQ contains a much greater quantity of natural minerals, consisting of around 93% granite, marble, glass, or mirror, and 7% epoxy resin. 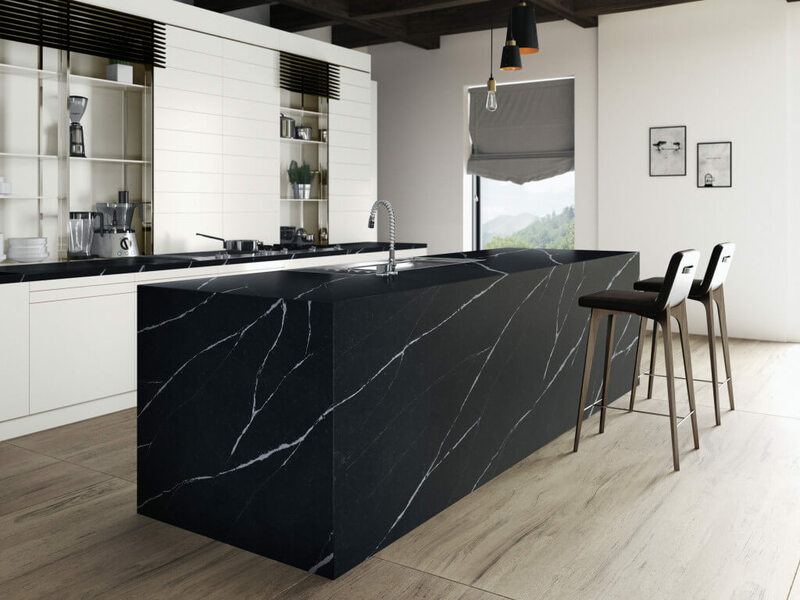 Although EQ was originally known for its solid and uniform look, today numerous lines are producing slabs that are barely discernable from granite and marble. With dozens of EQ manufacturers producing hundreds of colors, you have a choice from the most contemporary to the most classic design without worrying about sealing, staining, or scratching. In reality, price is the final deciding factor for all consumers. As a stone professional, I see all kinds of misinformation on the internet paraded as fact concerning the price of EQ and natural stone. The truth is, there is no single product that is universally more expensive than another. Prices vary by manufacturer and all lines are sold in price groups. Group pricing is also not universal, and suppliers and manufacturers all adhere to their own pricing systems. A Group A stone at one supplier could be considered a B somewhere else. It is highly possible to find a slab of EQ or natural stone that is less expensive than solid surface. However, you will never find a solid surface product that is worth as much as EQ or natural stone regarding durability and design.